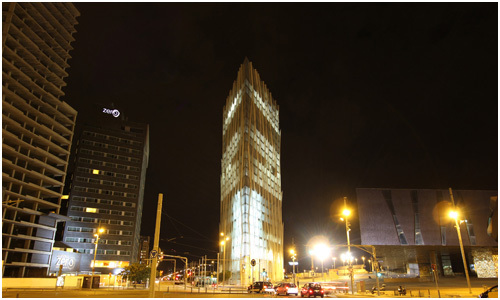 The Diagonal Zero Zero Tower (also known as the Torre Diagonal Zero Zero), is the new corporate headquarters for the Spanish telecommunications company Telefonica. Situated at the top of the Diagonal, Barcelona’s main avenue, the building borders the consolidated city and large expanses of public space. 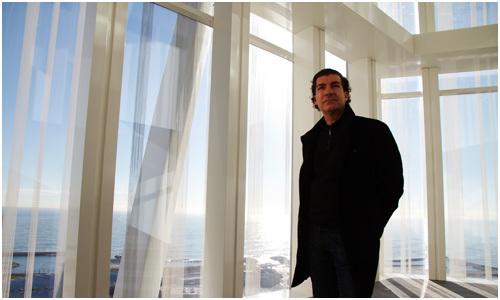 It is designed by EMBA (Estudi Massip-Bosch Arquitectes) with principal architect Enric Massip-Bosch. It is a contextual tower that has a double reading, from near and afar, in response to the two scales that such tall buildings must address. Taking the urban directions that form the perimeter of the plot as generators of its form, it is a trapezoidal prism, sharp and stylized, a clean and serene form, whitish and light, which reveals dynamic volumes that respond to the different specificities of the interior program and relate to the various heights of nearby buildings. The exterior responds to the city and the view from afar, and the interior responds to the program and the close-up vision. 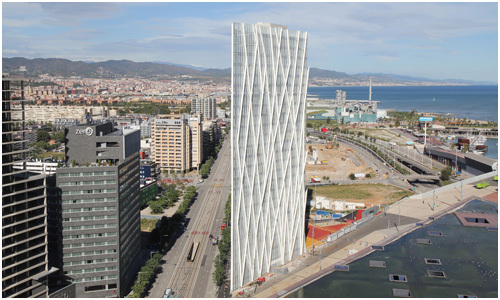 The corporate program that the tower hosts has a major public part that will connect it to urban flows, situated on the ground floor, which actually comprises three interrelated levels, around an atrium 40 meter high that follows the slope of the adjacent Plaça Fòrum. This direct visual and physical continuity with the city will help the tower benefit from civic activities and will facilitate citizens to participate and enjoy the activities in the building. Inside the tower four singular points make the ensemble dynamic and generate a variety of interior experiences despite being a relatively conventional program of corporate headquarters: the main lobby atrium, facing Diagonal; an atrium on the 17th level that goes all the way up to the top of the building, facing the Maresme coast; the terrace and the double height the Board Room, located on the 23rd floor; and the auditorium, which occupies two floors and is split into an orchestra and two amphitheaters that can operate autonomously for smaller groups. The upper floors are open-plan office spaces, taking advantage of the structural system, a tube-in-tube scheme, with a bearing central core and a perimeter structure along the façade. The perimeter structure is split into two parts: very small and slender vertical interior pillars that only take compression stresses, and external elements that bear horizontal forces and torque. These create a diamond lattice facade that follows the stresses of each part of the building, with the greatest concentration of bearing elements in the lower half and less so in the upper parts. The floors are solid concrete slabs that transmit these horizontal forces to the central core. 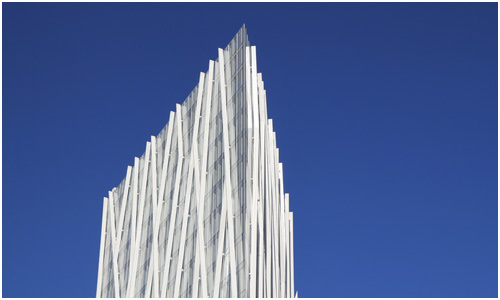 The facade is a modular curtain wall made of white aluminum profiles and extratransparent glass with white ceramic paint serigraphy, according to a vertical pattern that reinforces the slenderness of the building. In combination with the inner structure, placed every 1.35 meters, and the exterior structure, this pattern contributes to the diffusion of solar light and to glare control, generating interiors of great quality of perception. Torre Diagonal Zero Zero. Image Aerial. EMBA (2010). Used with permission.